Buy Cisco Systems Inc. (CSCO - Get Report) down to my semiannual pivot at $41.15 as the stock becomes one of the "Dogs of the Dow" for 2019. Cisco Systems became a component of the Dow Jones Industrial Average on June 8, 2009. This tech giant makes Internet Protocol networking products for the communications and IT industries. Cisco has a reasonable P/E ratio of 16.05 and a dividend yield of 3.57%, which ranks sixth among the Dow 30. Before becoming a Dow stock, Cisco set its all-time high of $82.00 back in March 2000. The stock then traded as low as $8.12 in October 2002 when this stock became one of my top longer-term picks. Cisco closed Wednesday at $42.47, up 10.9% year to date and in correction territory 14.2% below its 2018 high of $49.47 set on Oct. 3. The stock is also up 13.7% from its 2018 low of $37.35 set on Feb. 8. Cisco has had a volatile ride relative to earnings this year and has five consecutive quarters of beating analysts' earnings-per-share estimates. A positive reaction to earnings on Aug. 25 provided the momentum to achieve the 2018 high of $49.47 set on Oct. 3. Failure to hold the 200-day simple moving average at $44.84 on Dec. 17 fueled the decline to $40.25 set on Dec. 24. The tariff situation and weak local overseas currencies could squeeze earnings in 2019. Cisco began 2018 above a "golden cross" set on Oct. 16, 2017 when the stock closed at $33.54. A "golden cross" occurs when the 50-day simple moving average rises above the 200-day simple moving average and indicates that higher prices lie ahead. The horizontal lines are my semiannual value level of $41.15, my quarterly pivot at $46.16 and my monthly risky level of $48.27. With the stock below the 200-day since Dec. 17 the risk of a "death cross" cannot be ignored. 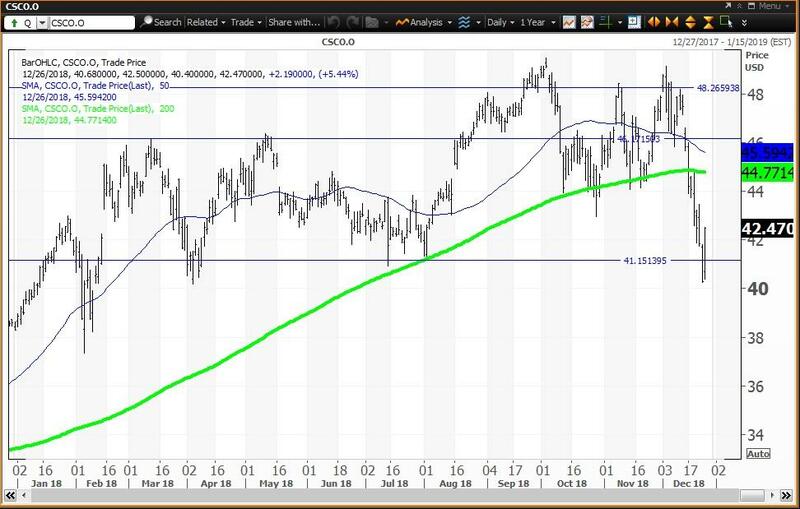 The 50-day and 200-day are converging at $45.59 and $44.77, respectively, and if the 50-day falls below the 200-day a "death cross" will be confirmed. This means that Cisco will fall into a bear market in 2019. For now, my semiannual pivot is holding. The weekly chart for Cisco is negative with the stock below its five-week modified moving average of $44.76. 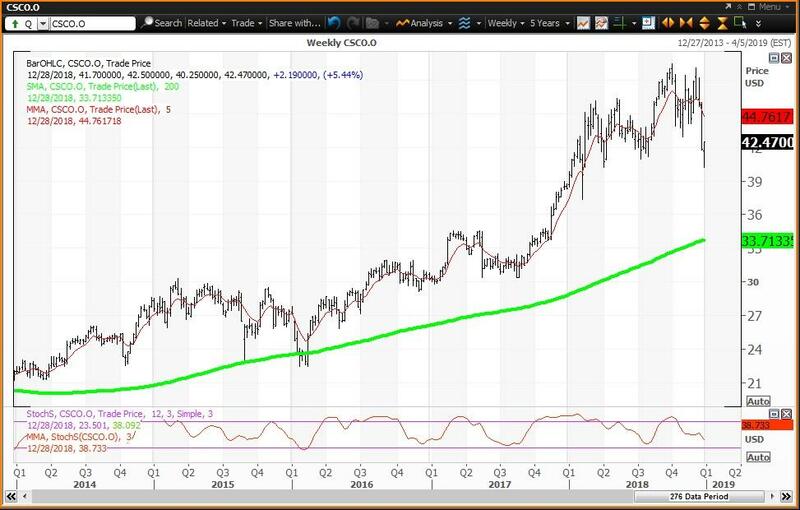 The stock is well above its 200-week simple moving average or "reversion to the mean" at $33.71, which is the downside risk in 2019. The 12x3x3 weekly slow stochastic reading is projected to end this week at 38.73 down from 46.35 on Dec. 21. Given these charts and analysis, my trading strategy is to buy weakness to my semiannual value level of $41.15 and reduce holdings on strength to the 200-day simple moving average at $44.77. With a dividend yield of 3.57% a starter position is justified as the stock will be one of the eight "Dogs of the Dow" in 2019.